When a metal roof system is installed properly, its life expectancy is second to none. According to the National Association of Home Builders, asphalt shingles last, on average, about 20 years, composite shingles about 25 years, and wood shakes or shingles about 30 years. Aluminum or steel roofs, on the other hand, can easily last 50 years or more, and zinc roofs have been known to last well over 100 years. But no building material, especially one that faces the constant weather battering of a roof, lives forever. Like all roofing systems, a metal roof requires regular maintenance and repair. Any roofing repair can be a hit or miss proposition. Done properly, repairs can last as long as the roof system itself. Done improperly, those same repairs can quickly break and fail, leaving the homeowner or building owner with a recurrent or constant leak. A recurring leak condition can be aggravating, but more serious is the interior damage and mold growth it can cause. It is always best to fix a roofing problem quickly and correctly. Repairs to a metal roof system can be particularly difficult. Metal roofing repairs are prone to premature failure because the patched area may have a different rate of expansion and contraction than the surrounding metal. This difference in expansion and contraction between the two products places stress on the repair, which can lead to cracking, splitting and, ultimately, failure of the patch. The following is a recommended process for repairing a hole in a metal roof system. It should work for nearly any type of metal roof, assuming you select patching material that matches the type of metal used in your roof. Most of the tools and materials you'll need can be found at any home center or hardware store, but you may need to seek some of these items from a roofing store that carries a range of roofing materials and repair products. Paint, color-matched to the metal panel being repaired. The first step in repair of any metal roofing material will involve cleaning the surface. A hole in a metal roof system can be caused by any number of sources—the hole may be from deterioration and rust, or it may be from something falling onto the roof surface, such as a large branch. No matter what the cause of the hole, the area around the hole is most likely dirty and will require cleaning. Thoroughly clean the surface of the metal panel using Simple Green or another cleaner, until the surface of the roof panels is completely free of any dirt, film, and algae growth. Any cleaner residue will compromise the integrity of the roof repair. After cleaning the surface of the metal panel, use a wire brush to scuff the surface where the repair will be made. Scuffing the surface will help the sealant bond to the metal. Use the wire brush only in the area to be patched; wire brushing beyond that may remove the protective coating from the metal panel surface, causing later deterioration. Cut the chosen sheet metal to a size that matches the area to be patched. The sheet metal patch should overlap onto the metal panel at least 2 inches past the edges of the damaged area. After the sheet metal patch has been cut and fit to size, round the corners of the patch with a file or emery cloth to prevent any sharp corners from becoming a catching spot for snow or ice. Once the patch has been measured, place it over the hole being repaired. Take a pencil and outline the patch onto the roofing. Remove the patch and examine the outline to make sure the patch will overlap by at least 2 inches in all directions past the edges of the damaged area. Apply the color-matched urethane sealant to the surface of the metal panel being repaired, staying just inside the marked pencil line. Apply the sealant liberally in the area, so that there are no gaps or voids at the leading edge of the patch. Press the patch into place over the damaged area. The sealant should squeeze out from the leading edge of the patch along all sides. If there are areas where the sealant is not oozing, these are areas where moisture may later penetrate under the patch, causing a deterioration of the patch. Apply a little more sealant here to eliminate any gaps. If the hole or damage to the roof is in the raised seam between panels rather than in the flat area of a panel, patch it with an asphalt impregnated glass-membrane fabric over the damaged portion of the seam itself. 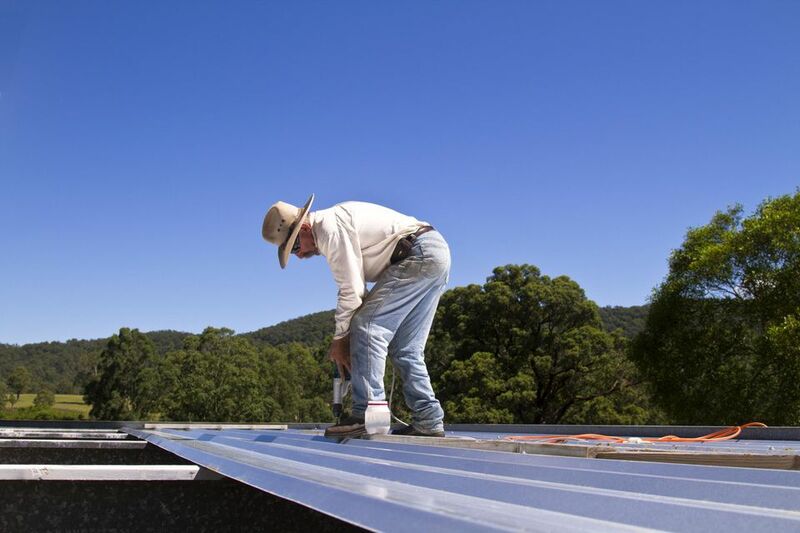 On raised-seam roofs, it is important that the individual panels be allowed to move along the seams, so never attach a metal patch that is anchored to both roofing panels over the seam. Instead, repair the damage to the seam with narrow strips of membrane fabric confined to the raised seam section. The patching strip should overlap the damaged area by at least 2 inches. Over the top of the patching strip, apply a coating of urethane sealant, then another patching strip. Done correctly, both roofing panels will still be able to move independently. Once the patch has been pressed in place, attach it to the surface of the metal roof panel, using pan-head sheet metal screws. Space the screws every 3 to 4 inches around the perimeter of the patch. The screws should be applied within 1 inch of the edges of the patch so that they apply uniform pressure to the edges and to the sealant beneath the patch. The screws should be only long enough to secure the patch to the underlying roofing panel. Never screw the patch down through the roofing panels and into the roof decking or rafters. As necessary after the patch has been attached, retool any sealant that is bleeding from the edge of the patch, using a putty knife. This will ensure that the sealant properly seals the edges of the patch and prevents moisture from penetrating. If desired, the surface of the patch can be painted to match the color of the metal roof panels. To do this, lightly wire-brush the surface of the metal patch and the metal panel just past the edges of the patch. Paint over the surface of the patch and onto the surface of the underlying panel. It may be necessary to wait for the sealant to cure before it will accept paint. Also, confirm that the paint is compatible with the sealant you used. Safety is a major concern when completing any roof repair project. A hole in a roof system may indicate that there are other concerns about the overall structure, including decking deterioration. Be sure to conduct a proper under-deck safety review and roof analysis before attempting to complete this or any roof repair. If there are concerns about completing your roof repair safely, contact a professional roofing contractor who can complete the repair for you in a safe and professional manner.